Are You Ready for a 'Quantified Life'? By now you likely understand that Apple, Google, your cellular carrier, and others can track your phone’s location. But you probably aren’t aware of the extent to which location tracking technology is evolving. Take, for instance, what’s going on at Alohar Mobile. The company has created a platform that lets developers build mobile apps that understand your behavior based on patent-pending sensing technologies. They can automatically detect the places you visit, including the names and types of locations, know when you arrive or leave, track how many times you’ve been there, and how much time you spent hanging out. They even understand if you’re standing still, walking, or driving. According to CNET’s Rafe Needleman, who spoke with Alohar co-founder Sam Liang about the technology, it doesn’t just use the GPS receiver and Wi-Fi hotspot triangulation to figure out where you are, but relies on other sensors and algorithms such as the accelerometer, compass, and statistical modeling to determine where you’re likely located. Needleman makes the point that automotive navigation apps also use a form of modeling which assumes you’re on a road even if GPS radios don’t exactly place you on one. Alohar works similarly: “If you're moving at walking speed, for example, it will place you on a sidewalk or in a building, not in the middle of the street. If the camera on your phone sees fluorescent light, it will try to geolocate you to an indoor location,” he writes. Having access to highly accurate location data means developers can create apps that can do cool things like sense if a person is in a car accident and call for help, or offer you deals, ads, and other information that is highly targeted according to where you spend your time. At the same time, this incessant location tracking can be disturbing to people who think companies already have too big a window into their personal data. Want to see how it works? 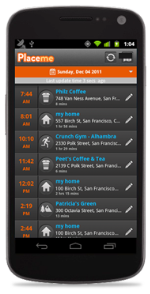 Alohar has developed a proof-of-concept app called Placeme that you can download for Android and iOS devices. You should know Alohar is far from the only company working on this. I recently wrote about several other companies active in the location tracking space, including Skyhook, Google, Wifarer, Nokia, and Broadcom, to name a few. For example, using Wi-Fi positioning, GPS, and cell-tower triangulation to determine the coordinates of more than 100,000,000 mobile devices, Skyhook maintains profiles on all of them and knows which ones are associated with certain kinds of people. If Skyhook sees that a device shows up at Wrigley Field four times in a season, it assumes that the person using the laptop is a sports fan. Or if a laptop or smartphone is detected in an airport several times a month, Skyhook guesses that the user is most likely a business traveler. Over time, Skyhook also figures out where all these devices live. Then, by mixing into device profiles publicly available data from the U.S. Census, for example, it adds demographic data such as age and ethnicity. For more on the subject, check out This Smartphone Tracking Tech Will Give You the Creeps.